Tioman Island has eight main villages; the largest and most populous is Tekek village. Though lodging and dining will not break the bank, hopping from one village to the other by a speedboat is quite pricey, so try to pick a village that best suits your needs. We initially planned to spend the weekend in Salang village but the chalet we wanted to stay was fully booked. I didn't want to stay in a so-called "garden view" chalet or a chalet facing other chalets so we tried to book another chalet and we were told that all the sea facing rooms were fully booked as well! After almost a half-day search online, Ralph suggested to go to Tekek village instead, where most of the duty-free shops are. That sounds good to me. I called up one of the resorts to check on sea-view chalets availability and guess what! Anyway, the lady at the reception was very helpful, she recommended me another resort and I managed to secure a stay in a sea facing room chalet at Coral Reef Holidays! Coral Reef Holidays is located on a relatively private beach, the longest beach in Tekek Village and it is about 800m from the jetty. The family who own this resort was incredibly welcoming and friendly. We arrived around 10am but they still let us checked in early! We stayed 2 nights in a "standard room" with air conditioning and an attached bathroom with hot shower for RM100 a night. Breakfast for two is included in the rate. The room was very basic but clean and comfortable, no musty smell, bed bugs or whatsoever. Don't expect a fancy luxury hotel (you can't expect luxury in this price range) or a hotel-like comfort, but it does serve you a completely relaxing and peaceful atmosphere. 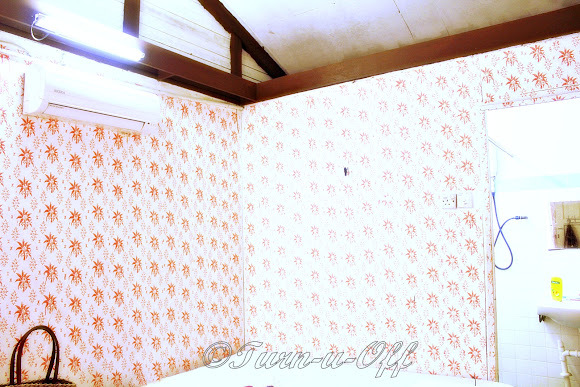 Air-conditioner was working like a champion; we had to turn up the temperature, as it was getting too cold! #6 The sea breeze greeted me when I opened the door in the morning and it was only a few steps away from the shore. #10 Each room has its own extended verandah with breathtaking sea views. #11 Also, there were hammocks along the stretch of the beach for us to just lay, chill, read or even sleep! Most Caucasian tourists stay here for a week or more. Peaceful and tranquil are the two best words I'd describe this place. #12 Ralph enjoyed relaxing with a cold can of beer on the verandah over looking the ocean. 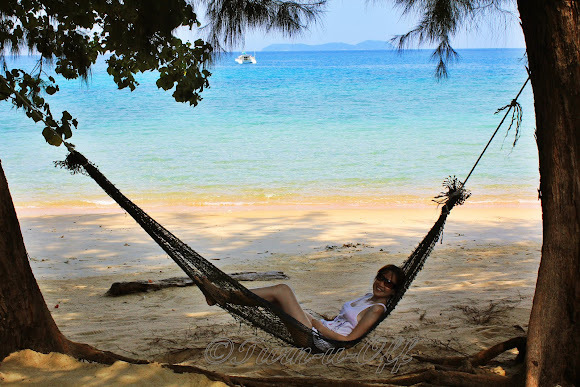 #13 I especially loved kickin' back in a hammock and relaxin' to the sound of waves, washing onto the shore! #15 The owner of the resort is particular about cleanliness and it's clear to see that one of his main concerns is preserving the beautiful surroundings. Hence, there are only a few sea view chalets to stay in to preserve the environment. #17 Corals are so unique and mysterious in forms. People love to bring a piece home as a remembrance but let me remind you, corals in Tioman Island are protected by law! A huge fine is charged to those who are in possession of a coral upon leaving the island. #21 The restaurant overlooked the beach and ocean. No matter where you stay on Tioman Island, you're guaranteed of crystal clear waters, perfect tranquility and a magnificent view and no matter what your budget, there is a wide range of accommodation available around the island! I was about to retire when I saw the tweet Mon.. The rate sounds really enticing and I love this sort of chalet where it opens up to sort of your own private beach... so worth the money!! never been to tioman before but the one that we stayed in at Lumut in Ipoh was also nice like this!! Wuah! Looking from the map image, soooooooo many accommodations to choose from!! I thought you had booked your accommodation prior to going! But then you were lucky to get the Coral Reef Holidays! It definitely is worth it.. RM100 per night inclusive of breakfast.. not bad at all! Plus, the place looked well maintained.. and I love that the sea is literally at your doorstep! :) Plus, the hammock and extended verandas looks cozy! I wouldn't mind staying there at all.. Sometimes getting a luxurious room is also not feasible when you're traveling especially if you spend most of your time outside and not in the room. :* :* :* :* Wah so early sleep, nite LJ! Last time I went Lake Kenyir could not get lake-facing chalet so forced the admin to get us one and they got us a haunted chalet! Now don't dare to use force to get a chalet I want haha!! This makes me wanna visit Tioman island myself! I really love the photo with you in the hammock.